Another of our famous photographic e Christmas cards for business, ‘Bridge Over Snowy Water’ captures the classic holiday scene of fallen snow covering a parkland scene. With just a scenic photograph, these corporate holiday ecards can capture your recipient’s imagination this festive season. A perfect winter Christmas scene can be found in this ECO2 ecard. After a heavy falling of snow, a bridge, trees and their surroundings are covered in pure white. The bridge itself, a small footbridge, crosses a river that is sure to have been frozen in such wintery holiday conditions. Footprints in the snow lead up to the bridge, and trees all around have their bare winter branches littered with fallen snow: a truly classic holiday scene. The ecard itself also features falling snow animations overlaid on the photograph to add to an already beautiful scene of the magic snow can give us. A personal message can be added, too, which sits at the bottom of the design, as well as second, third and fourth pages should you wish. These pages are perfect for corporate branding, such as slogans, logos, messages and contact details. 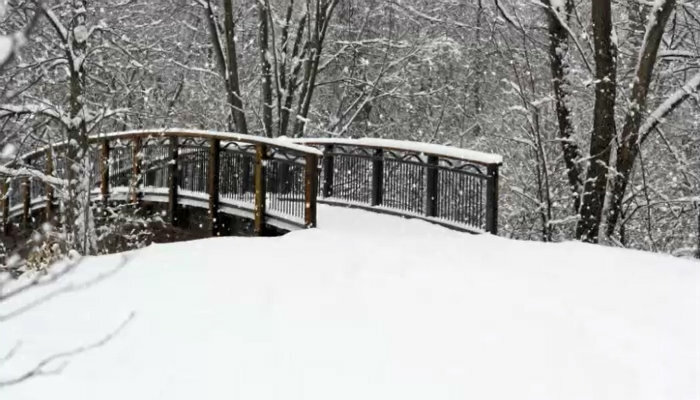 When it comes to holiday ecards for business, ‘Bridge Over Snowy Water’ is one of ECO2’s bestselling and best-loved. © 2019, eCO2 Greetings Ltd., ECARD SHACK.